An interval in music defines the difference between two pitches. Intervals are classified as Major, Minor, Augmented, Diminished, and Perfect. 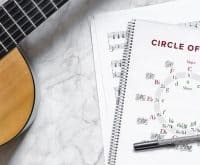 Major and Minor intervals are the intervals created by the key signatures in Major or Minor Keys without any added augmentation or diminished tones. Perfect Intervals refer to Unison, 4ths, 5ths, and Octaves. These intervals are given the name “Perfect” because they stay the same, whether the key signature is Major or Minor. Augmented Intervals are wider by one semitone (half-step) than perfect or major intervals. Diminished Intervals are smaller by one semitone (half-step) than perfect or minor intervals. Augmented 4ths and Diminished 5ths are the most common uses of Augmented and Diminished Intervals. 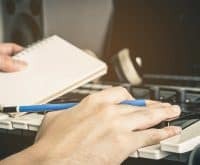 Though intervals are easily distinguishable on the staff, when it comes to memorizing and identifying them, it can take some serious ear training! 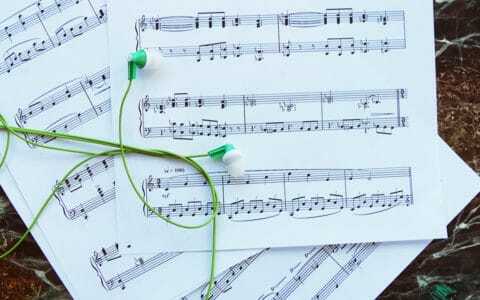 Luckily, we’ve put together some songs that everyone knows to help you identify your intervals in seconds. The minor second is the smallest possible interval, with only one half-step separating each note. The best piece to represent this interval is the Jaws Theme Song. The opening notes alternate between an E and F, going up and down a minor second. A major second consists of one whole step (or two half-steps). 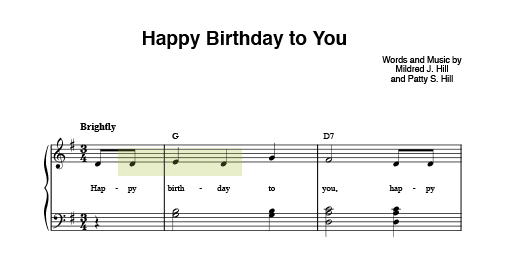 Everyone knows “Happy Birthday,” and in fact, a major second is at the very beginning of the song. From the highlighted “D” at the beginning to the “E,” is a major second up, and from the “E” back down to “D” again is a major second down. Simply sing the words “Happy Birthday” when you’re trying to identify a major second, and you’ll know right away. A minor third consists of one whole-step and one half-step (or three half-steps). 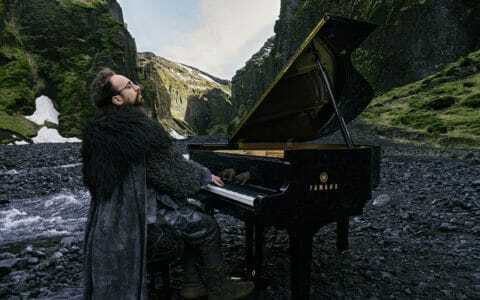 You may not think you know the tune of “Greensleeves,” but you probably do! 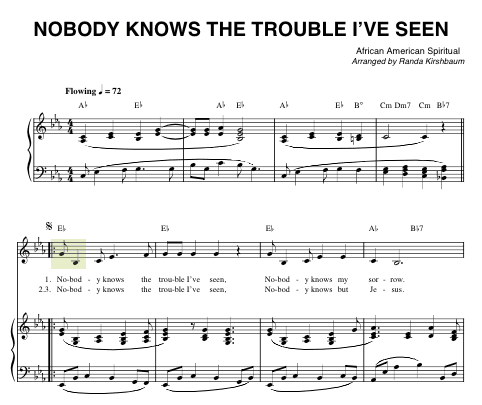 The popular Christmas tune “What Child is This” also shares the melody. The first two notes of the piece are a minor third. 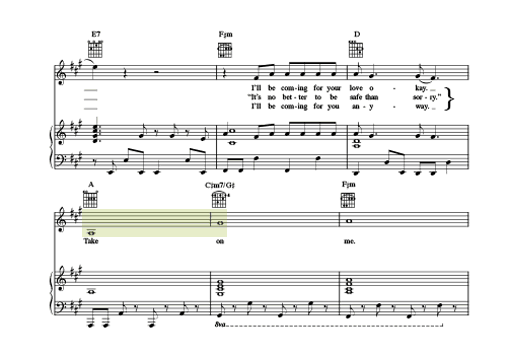 In the sheet music below the interval is from the first E to the first G (“A-las”). 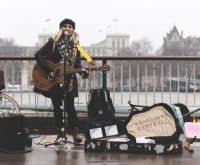 Another fun tune that you can use to identify a minor third is “Hey Jude” by The Beatles. 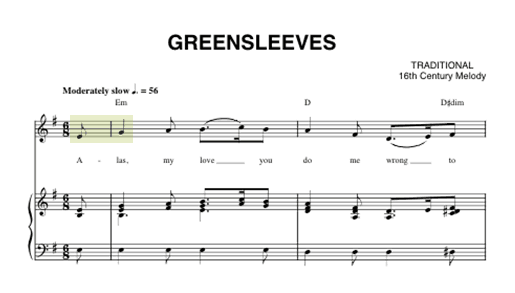 Just like “Greensleeves,” it occurs in the first two notes of the song. However, this minor third is descending, rather than ascending. 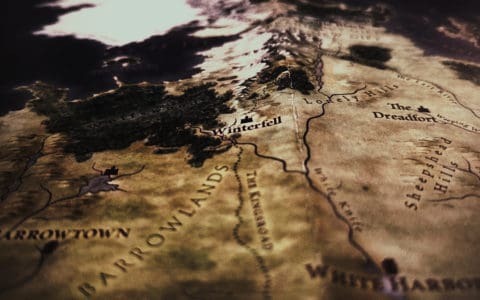 Moving into happier territory, a major third consists of two whole steps. 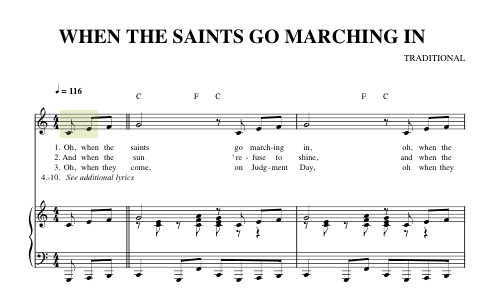 We like to use the first two notes of the classic tune, “When the Saints Go Marching In” to identify a major third. 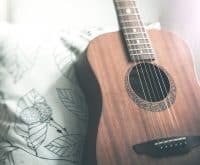 These intervals are called “perfect” for a number of reasons, some of which require a more in-depth historical analysis, but the best way to remember them is to keep in mind that their quality stays the same whether they are in major or minor keys. 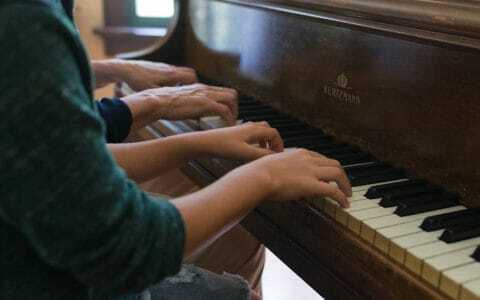 There is no “major fourth,” or “minor fourth,” because, in both types of keys, the interval distance stays the same. In a perfect fourth, that distance is two whole-steps and one half-step. 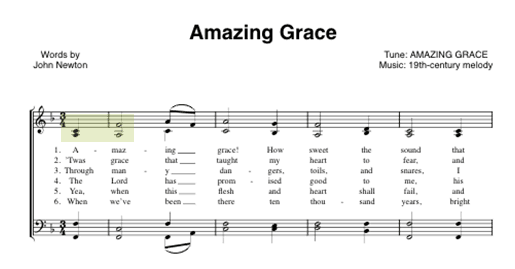 The first two notes of the traditional hymn “Amazing Grace” depict a perfect fourth. 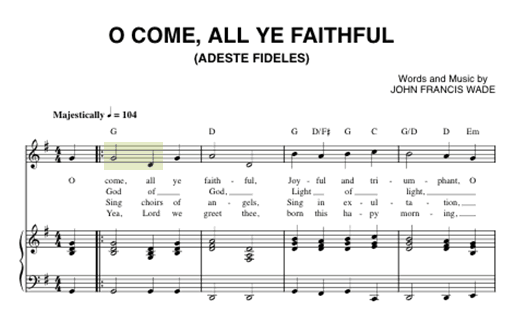 In the sheet music below, the interval is found in the upper voice, from the first C to the first F.
If you’ll recall, at the beginning of this article we briefly discussed augmented and diminished intervals. A tritone is a name given to an augmented 4th or a diminished 5th. It’s important to realize that augmented 4ths and diminished 5ths actually both consist of three whole-steps. If you’ll look at the image below, notice how the intervals visually look different. Then, listen to the audio to the clip, and you’ll hear that an F-Sharp and a G-Flat are the same note. Because tritones can sound very dissonant, they’re a little harder to identify. 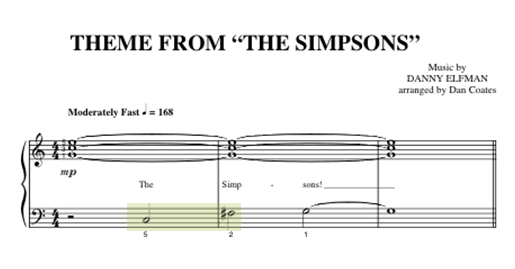 But it just so happens that there is a tritone right at the beginning of the incredibly famous theme from The Simpsons. We’ve struck another perfect interval! 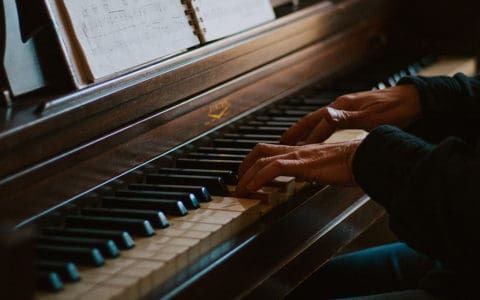 The perfect fifth is probably going to be one of the easiest intervals for you to memorize because it’s one of the strongest sounding intervals. 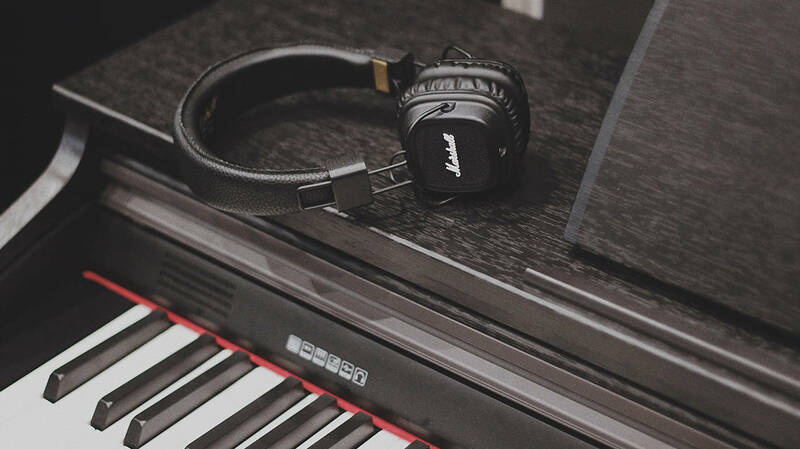 To reiterate, perfect fifths show up in both major and minor chords, so they’ll sound the same regardless of the key being major or minor. A perfect fifth consists of three whole-steps and one half-step. 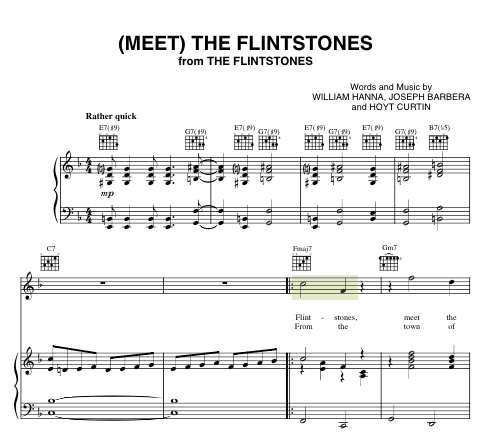 A great song for identifying perfect fifths is the children’s classic, “Twinkle, Twinkle, Little Star.” The perfect fifth is found in the jump from the first F to the first C.
Throwing another cartoon favorite into the mix, a descending perfect fifth can also be found in the theme song from The Flintstones. 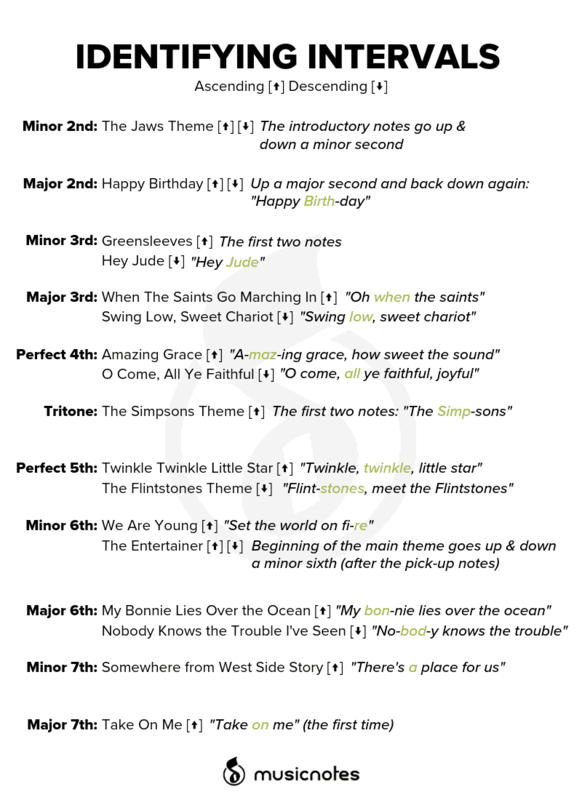 A minor sixth is one of the trickier intervals to identify, simply because it isn’t as common. Made up of four whole-steps, the interval is one half-step wider than a perfect fifth. 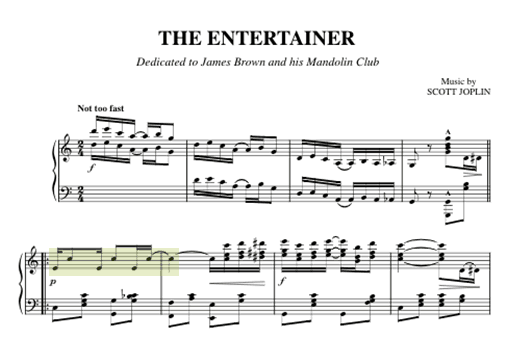 Scott Joplin’s “The Entertainer” is one of the most-played piano pieces of all time, and the beginning of the main theme goes up and down a minor sixth several times. 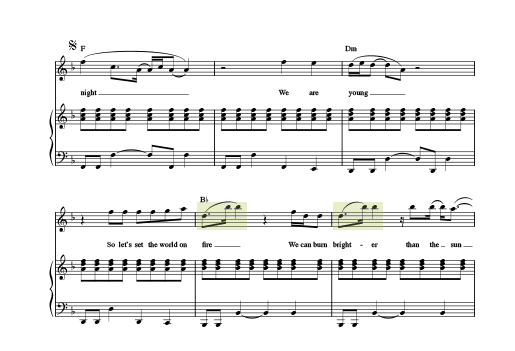 A minor sixth can also be found in the chorus of “We Are Young” by Fun. A Major 6th is an interval of four whole-steps and one half-step. 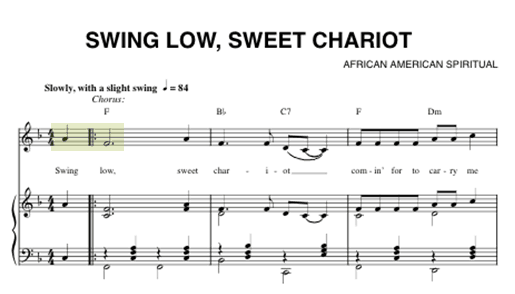 It’s often attributed with the first two notes of the NBC chimes jingle. 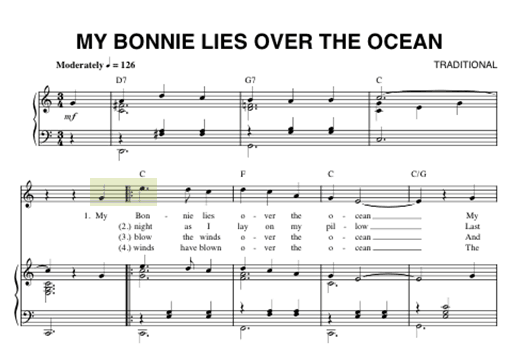 Another popular tune containing a major sixth is the traditional Scottish song, “My Bonnie Lies Over the Ocean.” Like many of our other examples, the interval is reflected in the first two notes of the melody. Minor 7ths and major 7ths can be easy to mix up because they’re getting very close to the tonic one octave up. A minor 7th consists of five whole steps. 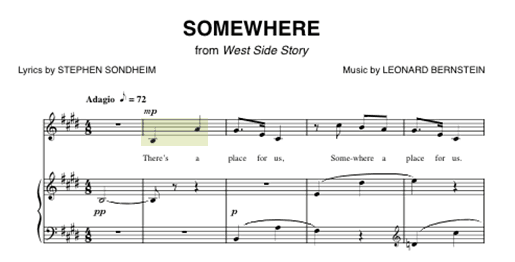 A minor 7th can be found in “Somewhere” from West Side Story at the beginning of the song. Finally, for the largest interval! The Major 7th is one half-step smaller than an octave and is comprised of five whole steps and one half-step. 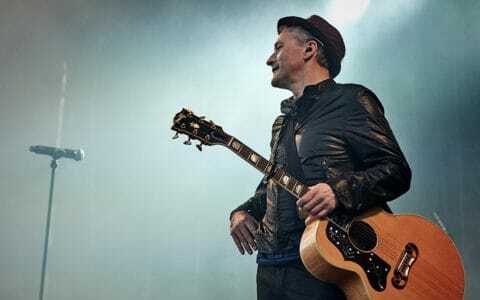 Though A-Ha’s “Take On Me” may be known for some stratospheric vocals, the beginning of the chorus actually kicks off with a major 7th. 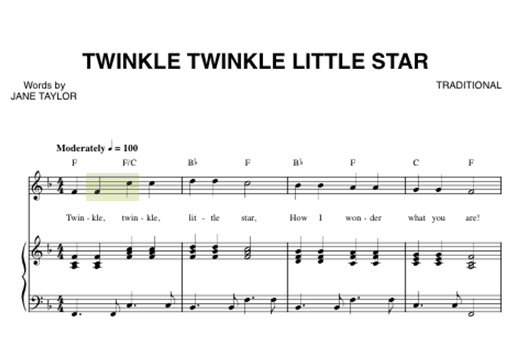 We hope we’ve made your life a little easier with these amazing interval pieces. Before we leave you, here’s a printable chart you can use for a cohesive summary! Click here to save the PDF.